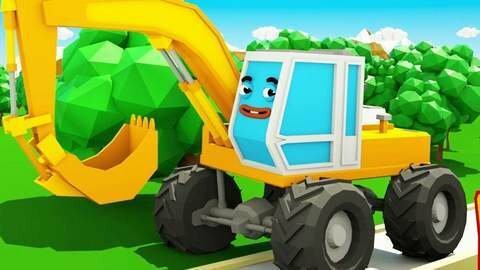 The red Bulldozer accidentally pins the yellow Excavator against a wall in this 3D car cartoon for toddlers. The Crane tries to help but ends up removing his wheels in the process. He gets new wheels in the auto shop but doesn’t know how to control it, which causes him to slip and meet other accidents. Have fun with the other adventures of 3D cars by visiting SeeZisKids.com.m.